Comprising a 56-storey commercial tower, a 16-storey residential block and a 7,000sqm retail space, this complex comes together to create an ultramodern gateway to Business Bay. Ramboll was appointed as the structural, building services, and fire & safety engineers. The residential building has a sweeping roof, starting at 12-storeys close to the tower, moving up to 16-storeys, minimizing the water-facing accommodation and retail space. The design of the commercial tower, with the floor area increasing as you move up through the building, is again designed to maximise prime space. 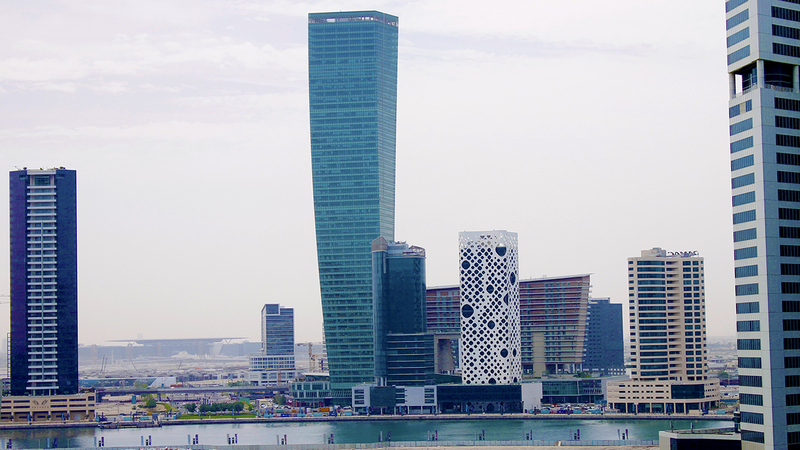 70% of the main tower’s 80,000sqm sits in the top half of the building, looking out over the lake at Business Bay. Ramboll’s structural engineering experts ensured the stability for this design through the core walls along with inclined columns and beams to resist the lateral load. These inclined columns are required to be tied back to the core at each floor level by beams. This system virtually eliminated the flat slab (beamless) plate option for the office tower. The horizontal forces are transmitted through the diaphragm action of the floor plates and resisted by reinforced concrete cores. The loads will be transferred directly to basement raft and piles. The residential building comprises two blocks connected by a bridge structure at mid-height supporting the rest of the residential floors above. The bridge structure and the residential floors above are made up of steel sections of varying shapes and sizes. The system enables us to minimize the loads on the bridge structure and the structure below all the way to the foundation.